Telangana will vote in a single-phase election on December 7. The ruling Telangana Rashtra Samithi had dissolved the assembly on September 6, paving way for early elections. 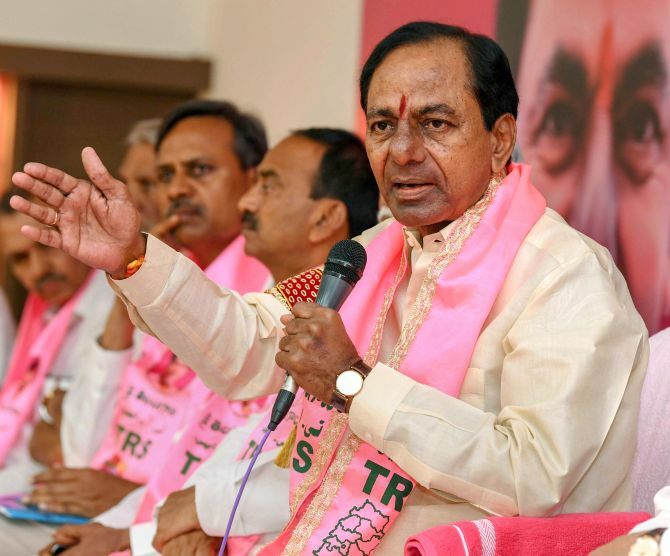 The TRS is seen to be going strong and will face contest from the Congress and the BJP. The TRS is going alone in the poll to the 119-member Assembly, as also is the BJP. The Congress has forged "Prajakutami" (People's Alliance) with the Telugu Desma Party, the Telangana Jana Samiti headed by professor M Kodandaram, and the Communist Party of India. After winning 63 seats in the 2014 assembly polls, the TRS' ranks have swelled with members of rival parties joining it over the years. Rediff Labs analysed the 2013 assembly election results to develop a Sentiment Meter for the 2018 electoral battle. A mathematical model is used to calculate how seat distribution will be altered as sentiment/percentage of votes towards a contesting political party changes. Based on the change, each constituency is marked with the winning party. A swing represents that the victory margin is close to the runner-up party. Move the pointer on the Sentiment Meter (depending on who you think will get more votes) towards the political parties to see how the outcome is likely to change. The below graph is based only on 2013 assembly elections data. For more data driven journalism, check out Rediff Labs. Will KCR return to power in Telangana? Is BJP ready to take on TDP, TRS in 2019?